A few friends, Cindy, and I made a whirlwind tour of Painted Hills, OR and Bruneau Sand Dunes State Park, ID over this three day weekend. Boy, what fun we had! We left Seattle 9:30 Friday morning and arrived in Mitchell, OR 6 1/2 hrs later. 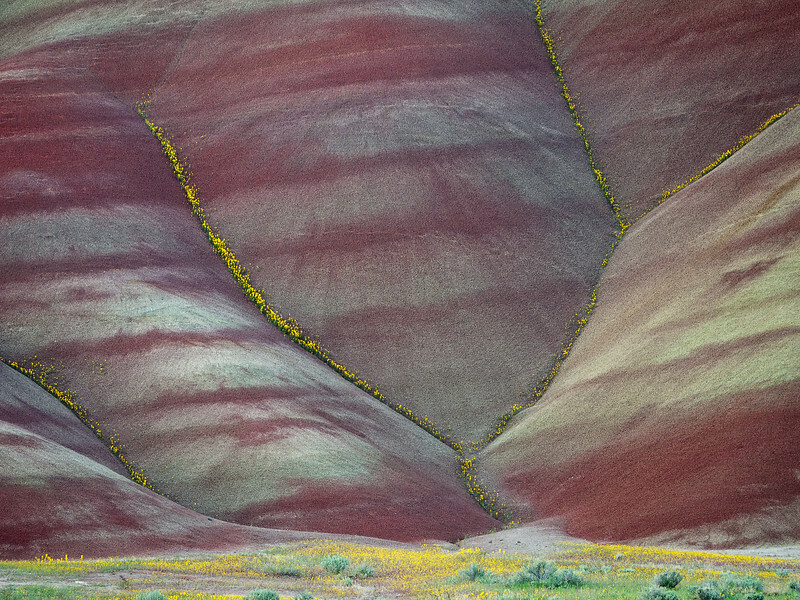 We set up our tents near Painted Hills and headed out to explore and photograph the area. 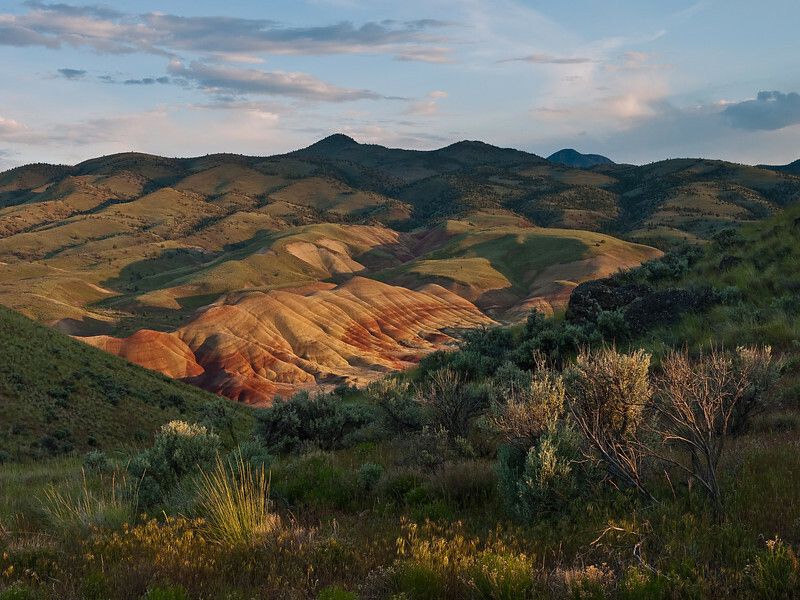 Painted Hills Unit is one of three components of the John Day Fossil Beds National Monument. These colorful hills are located about nine miles northwest of Mitchell, OR. The varying hues and tones of the hills are best seen in the late afternoon, but early light can offer dramatic backlit compositions for the creative photographer. The yellow wildflowers were in full bloom, and lined several cervices, as seen in the opening image of this blog. Below are three more images of this beautiful, ancient wonder. The next morning, we shot the sunrise at the same location and headed out to Bruneau Sand Dunes State Park, ID, another 6 hrs away. We arrived in the late afternoon, set up camp and headed out to climb the largest single Sand Dune in North America, rising 470 ft above small surrounding lakes. It was a short but tough hike. Below are two of my best images from there. The next morning (Sunday), we slept in and drove back to Seattle, 9 1/2 hrs away. By 8 pm, I was post-processing and uploading images. Third image is one of the most unique Painted Hills photos I’ve seen. Very Nice! Jeremiah, thanks! The 3rd image was taken from the top of the Carroll Rim Trail. It’s a less popular but equally beautiful hike, IMO. I love seeing what my little GF-1 is capable of! Keep it up Mahesh! Victor, thanks for the comment! The GF-1 is a little wonder. The more I use it, the more I love it. The quality Panny lenses deepen my love evermore! Great Photos and an area I wasn’t familiar with. Is the GF- 1 an slr? Chris, thanks! The GF-1 isn’t quite an SLR and it’s not quite a point and shoot. Some have dubbed it an EVIL (Electronic Viewfinder, Interchangeable Lens) camera. It’s small, lightweight, and thoroughly enjoyable. That’s quite a trip heading all the way over to my neck of the woods for Bruneau Dunes. I really like the reflection shot of the dunes…all the painted hill shots are very cool too. Aaron, thanks bud! I didn’t know you lived out there. Next time, I’ll shoot you an e-mail before heading out. Nothing less that spectacular Mahesh! These images are stunning! The painted hills are my picks. Woo hoo! Conrad, thanks bud! When you come up here, and if we have enough time, we’ll visit the Painted Hills. You won’t believe your eyes! Wow what a kewl shot Mahesh!! Great landscapes and I may have to put this on my List of “Things to photograph” for a future trip!! Thanks mahesh. I’ve had SLRs in the past film era. But have only had small Canon’s in the digital era. Maybe the GF-1 is the way to go? Chris, no worries! I think you would enjoy the GF-1 very much. It’s my preferred camera for travel and landscape photography where I have hike/backpack. Unbelievable!!! Your photographs make me want to visit ths area immediately, if not sooner. Keep up the great work. Meg, thanks! Always nice read your kind comments.